Prior to the iconic 1902 building’s opening, the land it was constructed on went by some interesting names. 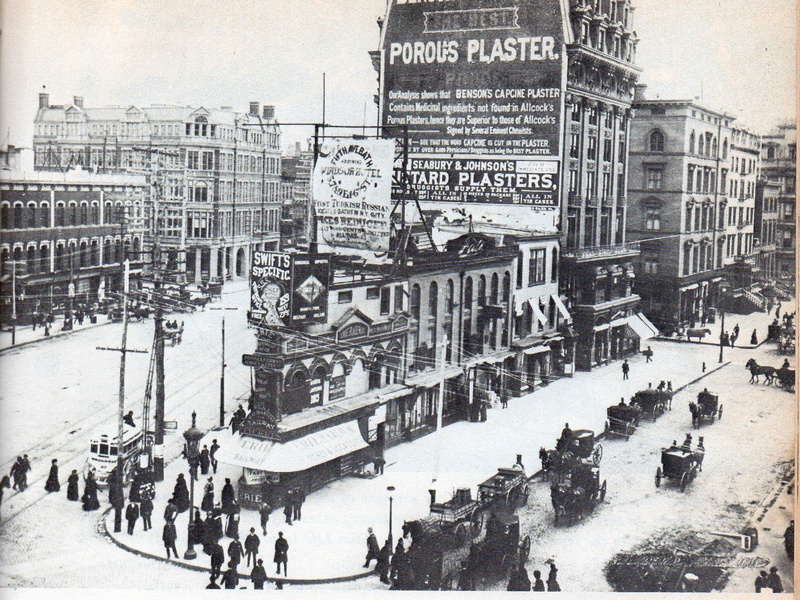 In the 1850s, the triangle-shaped plot at 23rd Street, Broadway, and Fifth Avenue was known as the “cowcatcher,” possibly because cows from nearby farms often wandered into it to avoid traffic, according to The Flatiron by Alice Sparberg Alexiou. Cows on 23rd Street? That name had to be a holdover from an even older New York. “Cowcatcher” could also have come from the fact that the land resembled the three-sided metal device that back then was attached to the front of locomotives to prevent derailment in case livestock crossed the tracks. In the 1880s a real rich estate developer, Amos Eno, put up a seven-story apartment house on this slice of the ultra-fashionable Madison Square neighborhood. The cowcatcher moniker fell out of favor and the triangle was called Eno’s Flatiron—or just the Flatiron, because it looked like, well, a flat iron. 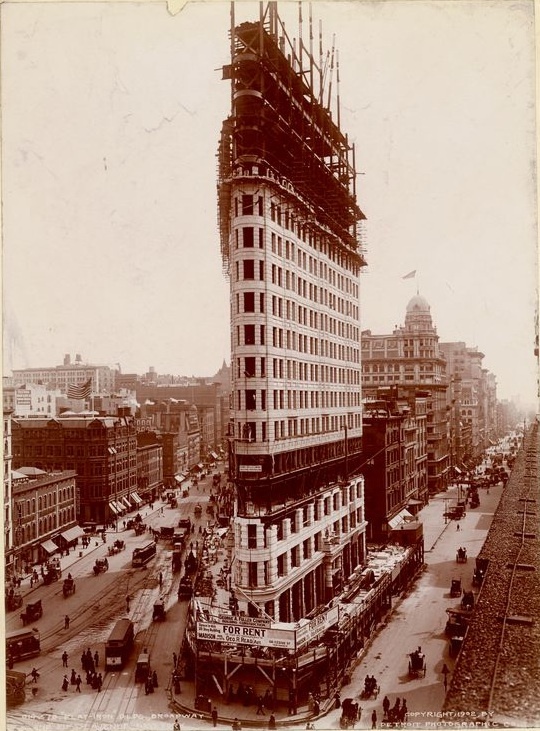 The 1902 Flatiron Building was actually officially named the Fuller Building when it opened. But most city residents still called it the Flatiron—or more derisively “Burnham’s Folly,” after the architect whose design was not nearly as beloved 109 years ago as it is today. This entry was posted on June 27, 2011 at 4:43 am and is filed under Cool building names, Fashion and shopping, Flatiron District. You can follow any responses to this entry through the RSS 2.0 feed. You can leave a response, or trackback from your own site. Er, uh….they called it the cowcatcher because that’s exactly what it looks like, the cowcatcher on the front of a train’s steam engine. Yes, that explanation is in the post. If you scroll to page 26 of Alexiou’s book, she also mentions the other possible reason it was called cowcatcher. ah that ol’ truth in advertising hasn’t changed a bit! Thanks for the story shedding light on what came before a favorite landmark. A fascinating player in the block’s earlier life is Amos R. Eno, better remembered as the party who, after buying the Hippodrome on the northwest corner of 23rd St and Fifth Ave, built what would become the Fifth Avenue Hotel. (How’s that for a pair of Ephemeral candidates?) After a bit of internet research, Eno’s activities show how the term flat-iron changed from his time to ours. Your paragraph about Eno’s 7-story apartment building came as a revelation, and I wanted to learn more about why such a building would rise and fall in such short order. Originally, I assumed that it was the northern part of the block, replacing the low-rise buildings in your first photo, but all documentation refuted that idea. After taking a look at the link to the book, I see that your paragraph is drawn from the author’s background story on the skyscraper’s building lot. I think confusion has arisen because of our wider interpretation of the “flatiron territory” when compared to that held by New Yorkers in the late 19th Century. I think that Alice Sparberg Alexiou’s account of the Flatiron Building might be a bit off when it comes to lot ownership, but it could be that the “unavailable” pages from her book would put me straight. In January, 1856, the newly built St. Germain Hotel was opened on the south section of the block, and until later joined by the set of Eno-owned, low-rise buildings to its north, stood alone upon the entire block. The St. Germain failed like many other Manhattan hotels in the 1870s, but contemporary accounts suggest that it was raised, not razed. Extra floors were added, and interiors were doubtlessly overhauled. Auctions were advertised to be entirely selling off the hotel furniture. I wasn’t able to find any evidence of Eno owning the hotel, the Cumberland to which it was converted, or the lot upon which it stood. When the Flatiron Building was being planned, it appears that the Newhouses (who bought the “Eno lot”, too) bought the south lot from the estate of Hickson W. Field, who had owned it from mid-century. All references to the “flat-iron” lot and Eno that I found are describing the north section of the block. It was well reported at the time that the “Cumberland Apartments” lot was a second, unrelated portion of the land assembly. It’s always good to see where we have came from, in this case, a look at the building/construction past of the lower fifth avenue era. While today’s architecture is great in its own ways, the architecture of years past bring their own unique features that are not found today. For more photos, designs and looks at examples of new york building construction, check out McGraw Hill NY.